championship trophy after beaing top-seed Don Bosco. 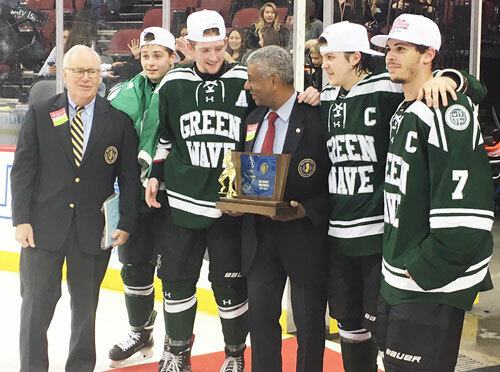 1-Delbarton (26-3-1): The Green Wave will have their sights set on a fourth straight NJSIAA Private title as well as a third consecutive Gordon Cup this season. Coach Bruce Shatel again has some offensive weapons to deploy in returning forwards Michael Balzarotti (11-15-26), James Falivene (16-12-28), Max Williams (3-11-14), Brendan Clark (4-18-22, committed to Brown University), Ben Conrod, Tim Royse, James Monahan and Ryan Siffringer. 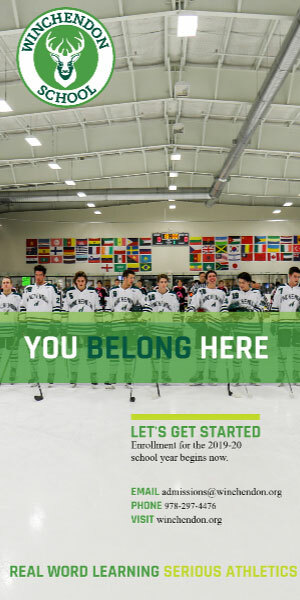 Delbarton will rely on defensemen J.P. Nolan, Kieran Kraus and Jack Benitez along with a goaltending tandem of Brett Cleaves and Max Banoun. Watch for freshmen defenseman Ray Berezniak. 2-Don Bosco Prep (27-2-1): The Ironmen will surely be back in the hunt for a Gordon Cup and state championship this season. Don Bosco looks solid all-around with skilled forwards Tyler Sedlak (28-40-68), Liam McLinskey (10-12-22), Connor Sedlak (12-8-20), Robbie Greenleaf (6-3-9) and Michael Forgione (2-4-6) all back. Defensively, Don Bosco is stout again with the likes of T.J. Schweighardt (2-22-28), Jake Howard, Will Fortescue, Damien Carfagna, Jake Geraci and Michael Rubin all returning. Backing that blue line is talented goalie Max Schwarz, who posted a 1.19 goals-against and a .933 save-percentage last season. 3-Christian Brothers (17-9-2): The Colts were young last season but are ready to skate to the next level and grab its first NJSIAA Private title since 2015 with much of that stable back. Coach Ryan Bogan’s club came on impressively as last year progressed and posted an 11-3-1 finish, with all three setbacks against No. 1 Delbarton. Highlighting the offensive are swift skating Kyle Contessa (12-7-19) and Gio Crepaldi (5-9-14). Goalies Jake Brown (2.20 GAA, .917 save-percentage) and Thomas Heaney (2.20 GAA) are back behind experienced defensemen Garrett Silverman (3-14-17), Matthew Herrick (3-6-9) and Logan Heroux (3-1-4). Bogan has been impressed with newcomers Evan Brown, Nick Wallace and Zacharay Wagnon, all forwards. 4-Pope John (14-11-1): All-Stater Matt Schoer (.925 save-percentage), who turned in one of the most impressive state tournament games in New Jersey history last winter when he stopped 79 shots in a 2-1 overtime loss to Don Bosco in the NJSIAA Private quarterfinal round, is back in goal. A trio of talented blueliners who delivered impactful minutes last season include Ryan Cielo, Jake Ferguson and Mike Quatrella. Pope John also has some solid scoring punch with forwards Steven Spetz (7-8-15), Johnny Cielo (13-8-21), Alex Blaszak (3-12-15) and Hugh McGuigan (4-3-7). 5-Gloucester Catholic (13-8-1): After winning the Gordon Conference National Division last season, the Rams move up to the American. Coach Tom Bunting enters his season returning one of the top forwards in the state in speedy P.J. Demitrio, who finished with 25 points on 13 goals and 12 assists in 2018. He will have help up front with forwards Connor Milliken (9-8-17) and Matt Frett (5-5-10). Buntin has been impressed with center Dom Garozzo. Jake Grace (3-9-12) leads the blue line while Chris Lisicio returns in goal. 6-St. Augustine Prep (10-12-3): Whether possessing top scoring threats or not the Hermits will rarely be outworked or outplayed. Coach Tim Fingerhut’s bunch will bring it regardless in every match. Excellent two-way forward Julian Boisclair (8-9-17) again leads the Hermits offense this winter along with center Josh Karnich (3-8-11). A strong contingent come back to bolster the back end with Brendan Karnish (2-8-10) and Jacob Creasy (4-7-11). Fingerhut is high on promising left winger Alex Scimeca. Jacob Brown, who posted a 4-2 record last season, is back between the pipes. after beating top-seed Randolph in the final. 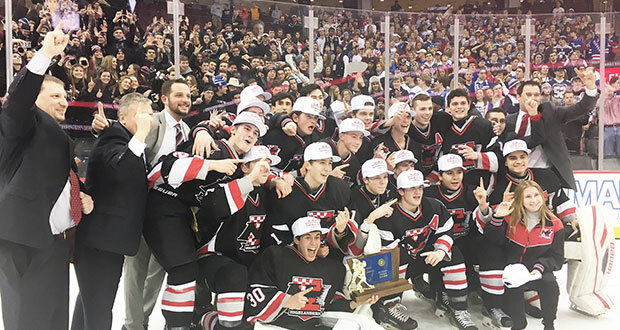 7-Northern Highlands (22-5-1): The Highlanders enter the campaign after securing their first state championship, earned with a 1-0 verdict over Randolph in the 2018 NJSIAA Public B final at the Prudential Center in Newark. Northern Highlands had suffered setbacks in its two previous trips to the Public B final (2008 & 2009). Coach Jason Beswick has no worries in goal as one of the state’s best in John Werber will strap the pads on again. Werber earned five shutouts and boasted a .936 save-percentage and a 1.20 GAA in anchoring the title run. Also returning are forwards Cormac Cindrich, who scored the game-winner in the state final, Mark Cinotti and Jack Sparago. Defensemen Sean Vlasich, Aidan Connolly and Mason Prugh are all back. 8-Summit (24-2-2): The Hilltoppers have their sights set on equaling a marvelous 2018 winter, when they won the Ice Vault Pepsi Classic, the McInnis Cup and the NJSIAA Public C championship – the latter with a 3-0 victory over Chatham when Nikita Pryymak stopped all 32 shots. However, the talented goalie suffered an injury, so it remains to be seen how Summit will respond and when he can return to action. 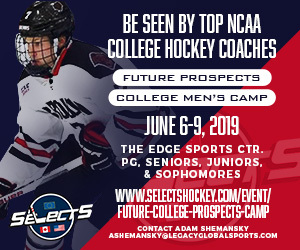 There is a load of talent returning in forwards Greg Spitznagel (20-9-29), Luc Radice (10-11-21), Tom Pryymak (19-22-41), Jake Puskar (11-12-23) and Charlie Collins (5-11-16). The blue line remains strong keyed by Greg Moller (1-9-10), Spencer Myers (1-6-7) and Matt Vigliotta. 9-Randolph (22-2-3): The Rams were edged, 1-0, by Northern Highlands in the Public B final last season, barely missing a chance to grab their ninth state championship. The mission will be to return to the final again. Coach Rich McLaughlin enters his 26th season with a 416-180-62 career record and will craft his usual disciplined, defense-first squad. One of the state’s best all-round forwards returns in J.T. Zangara, who netted 14 goals to go with 29 assists last winter. Joining him up front are James Mattson (11-6-17), Justin Harper (6-11-17) and Nick Gallo (3-7-10). Austin Cross (10 assists) and Mike Sofia (3-11) will lead the blue line in front of newcomers in goal Matt Cuizio and Gavin Einfeldt. 10-Madison (18-7-1): The Dodgers, who captured the Halvorsen Cup and lost 3-1 to Ramsey in the NJSIAA Public C Round of 16 last winter, field a pretty impressive lineup again. Halvorsen Division MVP Matt Ubertaccio returns in goal after posting an 18-7-1 record with a 1.50 GAA and .939 save-percentage. David Renzulli finished with 39 points (20-19) and is back to lead the offense along with Kyle Pruzick (6-19-25), Aidan Niceberg (11-12-23) and Ian Skinner (3-13-16). 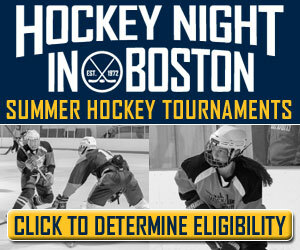 Keep an eye on defensemen Jett Tom (16-15-31), Jack Downs (2-4-6), Matty Gero (6-13-19) and Ryan Catlin (2-14-16). Paul Bruno covered college and high school ice hockey for The Newark (NJ) Star-Ledger from 1988-2012. A 1984 graduate of Seton Hall University, he played collegiate hockey for The Hall in the Metropolitan Collegiate Hockey Conference. He also served as an intern in the New Jersey Devils public relations department during the 1983-84 season. 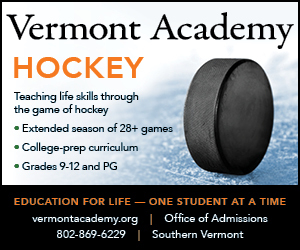 Bruno later coached the Seton Hall University ice hockey team (1985-1987) and has covered the New York Rangers and New Jersey Devils training camps as well as the ECAC ice hockey championships in Lake Placid, NY, for the Ledger. Bruno, who has been a contributing hockey writer to New Jersey Monthly Magazine, has covered hockey for Sideline Chatter for the past three seasons.